Buy a Pogo Pass. Consider this an investment that will last you an entire year. Use code IHEARTAZ and get 60% off, which makes these passes $39.98 each. For an entire year, your Pogo Pass will get you to Sunsplash, AZ Diamondbacks games, Sea Life Aquarium, Phoenix Rock Gym, and lots more for FREE. We went to a Rattlers game recently and had a blast. These passes are fun for adults or families with small children and really anyone else. Try some classes at your local community center. We love the Red Mountain Multigenerational Center in Mesa. Oftentimes they have open gym for a very reasonable price or other activities like Wiggle Worm Adventures (for 5 and under) at the McQueen Park Activity Center in Gilbert. Join a gym or the YMCA. Maybe you don't want to commit to a full year, but a gym for the summer is a great idea. Call around and find one that has a low enrollment fee (or no enrollment fee) so it's easy to cancel at any time. Also, check out your local YMCA to see if a short-term membership might be a good fit for you and your family. I have a friend who got a good deal on enrollment to the Y and plans on using it only for the summer with her family. Buy a pass to a science center or children's museum. Take advantage of reciprocal membership. Of course we love the Arizona Science Center. With our membership we also get in to Flandrau Science Center in Tucson and the Challenger Space Center in Flagstaff. Last year when we traveled to Texas we were able to visit two science centers there for free with our membership. A friend of mine has a membership to the i.d.e.a. museum and uses the reciprocal membership on road trips. The family stopped at several children's museums for free on their trip up the West Coast. See reciprocal membership info here and here. Check out the deal sites. Look for bargains on Groupon, Living Social, and Deal Chicken to find fun things to do or restaurants to visit at a bargain. Some fun deals going on right now for Arcadia Ice Arena, Pump it Up in Tempe, Odysea Mirror Maze in Scottsdale, Game Works in Tempe, and Dairy Queen in Scottsdale. Explore another city in AZ. Pick a city in AZ depending on how far you want to drive. Check tripadvisor for some recommendations of things to do, explore, and eat. Make a day trip out of it or pick something close by and visit a new attraction or restaurant. 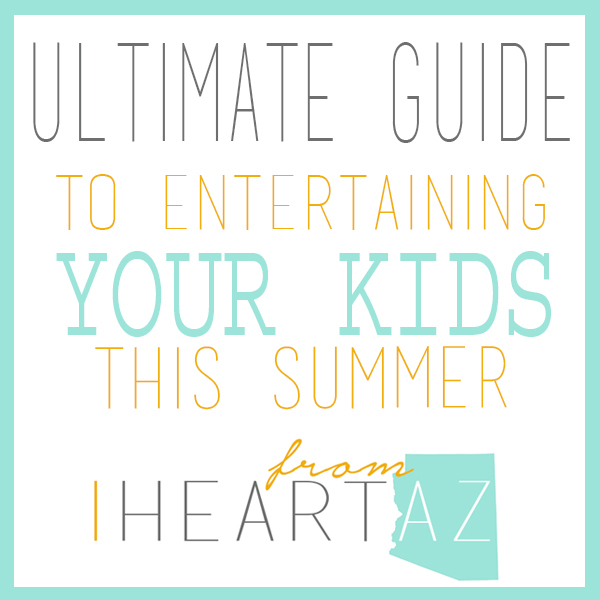 Visit one of the many Arizona Planetariums and Observatories. Get kids involved in Arizona Code Clubs. Kathryn posted about Mesa Code Club which happens every Monday afternoon at the Main Library in Mesa. This is a free opportunity for kids to learn computer coding. There is also a group that meets at the Red Mt Library and a new group in Scottsdale starting soon. Go here for more info. Summer Reading Guide: Reading programs and other ideas for keeping reading fun all summer long. Hall of Flame Museum of Firefighting. Groupon has a deal right now $15 for four people. Amazing Jakes VIP Summer Pass (Mesa) Buy a summer pass for $49.99 which is good through the end of August. Pass includes 3 hours of fun and the all-you-can-eat buffet every day. Seems like buying these could basically save you that much in groceries if you go often enough.